This book considers the role of the Lord's saving grace in the mortal experience. Comprising collected essays, Bruce Hafen writes of the important doctrine of the Atonement. A bestseller in hardback, The Broken Heart will encourage, uplift, and inspire. ***Audiobook is the original (nonrevised) edition read by the author. Through the reading of this volume of enlightenment I have increased my know and understanding of grace and the atonement. I have read and listened with real intent and found that with the other books about grace and how it works we can and will by accepting the gift of grace we can be reunited to our Savior and Father in Heaven. Elder Hafen's understanding, inspiration, and insight provide a useful cog in the learning and knowledge each Latter-day Saint should have. 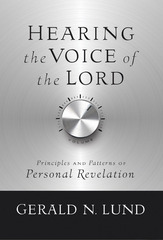 There are powerful messages in this book that will lift the heart and bring you a greater understanding of what the Lord has in store for those that love him. A superb book that should be in every Latter-day Saint home and devoured as a companion to the scriptures. The Savior's Atoning sacrifice does way more than just save the big sinners. Accepting Christ's atonement is better than paying for our own sins and is the only way to perfection. The message of the book encourages daily repentance by all. Often we learn and study how the Atonement covers our sins after all we can do. Not often are we taught how the Atonement covers/compensates for our suffering. When we do, it also seems abstract. This book is enlightening on how the Atonement and our life melds together in a broader perspective. I was profoundly affected after reading this book. I recommend everyone to read it. It is simple to read, easy to understand, and very thought provoking. Many gospel books are good, but not thought provoking, this book is both. This book forces you to deeply engage your thought process and to come out with a much better appreciation of the Atonement. This is an excellent book that clearly explains what it takes to live gospel principles and better apply the Atonement in our lives in order to live 'the higher law'. It is easy reading and very straightforward yet meaty enough for the learned. I love it! This is just an excellent book. It helped me after I went through a divorce. This book was wonderful in helping to understand the atonement and how it applies to everyone. I found this book to offer enlightening perspective on the Atonement and cast insight into some aspects not frequently addressed. An easy read. I don't recommend many books to people, but this is one I whole-heartedly recommend reading. I'm glad it was brought it back into print. This should be required reading along with scriptures. I love this book! It has uncommon insight while the presentation is straitforward and easy to understand. I've gained a larger foundation for applying the Great Atonement to my daily life and can apply this knowledge now to my relationships. Good Job!! Thank you!! I can't remember any book, other than the scriptures, that have had greater spritual impact. The operation of the atonement is discussed in a very direct and simple manner. Even for someone will versed in doctrine the book is a good review. For those who are learning this book provides day to day application of the atonement--partaking of the sacrament will take on increased meaning.